They may be over five thousand miles apart, but Mexico City and Dundee will be linked this week as Digital Futures UKMX kicks off. Designers, artists, makers, engineers and the public will be joining forces in a two-day event packed with collaborative making, urban walking tours, talks, cultural exchange and live links between the two cities. One of the UK project leads is Irini Papadimitriou, Digital Programme Manager at the V&A. Can you tell us a bit about your background and your work up to now? I am Digital Programmes Manager at the V&A Learning Dept. We set up our team in 2008 with the aim to engage visitors of all ages in a range of activities and events that promote digital art, design practices and collaborative processes. We want to enable people to explore, learn and be creative with technology, to reveal processes and empower visitors to become makers and not only consumers. Tell us about the how the Digital Futures project started. I started the programme in 2012, although I've been organising the annual Digital Design Weekend at the V&A since 2010. The Digital Design Weekend (part of London Design Festival) is an annual event bringing together artists, designers, engineers, scientists to explore intersections of art/design/tech with an interest in contemporary issues. We explore ideas and themes such as digital value, data & privacy, environment, electronic waste, digital commons, open design, etc. Over the years, the Digital Design Weekend has grown and we had some amazing collaborations taking place. But, with an annual event, it was difficult to keep the discussions going and sustain all these relationships. So in 2012 I decided to start a monthly meetup and open platform, Digital Futures. Digital Futures is basically an open studio event & showcase for researchers, artists, designers and other professionals working in the intersections of art, design, technology and science. The aim is to offer a space to display and discuss work, but it is also a networking event, bringing together people from different backgrounds and disciplines with a view to generating  future collaborations. The programme doesn't have a fixed format, so each session is shaped depending on the content, hosting space and participants. The sessions include talks, panel discussions, displays, open workshops and prototyping. Participants are established and emerging artists and designers as well as studios, start-ups, and universities - both UK and international. 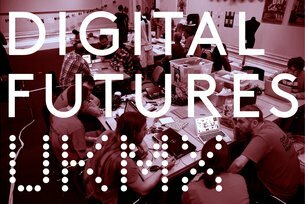 What’s the relationship between Digital Futures and Dundee? The Small Society Lab [a joint project between Dundee Contemporary Arts and Duncan of Jordanstone College of Art & Design, University of Dundee, led this year by Creative Dundee] is a very exciting project which is focussing on the development and understanding of the small city of the future through the intersections of art, technology and community. Small Society Lab and Digital Futures have come together a few times in the past two years, mainly to discuss ideas that are central to both programmes. With the future V&A Museum of Design in Dundee there are some great links. There is an amazing community of artists and designers in Dundee, so having opportunities like this to come together and collaborate is brilliant! Digital Futures isn't fixed in terms of venue; it has been taken place not only at the V&A but also at BL-NK Old Street, Mozilla Festival, Dundee Contemporary Arts, Mobile World Centre Barcelona, EVA London Conference and currently at The White Building. We’re about to travel to Mexico to launch the project there. What do you think are the challenges and opportunities in connecting cities like Mexico City and Dundee? It's very exciting to be able to work with organisations in Mexico City such as Laboratorio para la Ciudad, Centro de Cultura Digital and Laboratorio de Arte Alameda. This is not just about networking, but it's been an amazing exchange as we have already spent a few months working with the partners in Mexico City and Dundee exploring ways of connecting our programmes and bringing our practices together.. It will be very interesting to see what happens when we connect people from a huge city like Mexico City with a population of 22 million and Dundee with just 149,000 residents. Of course these two cities are quite different, so this is an opportunity to celebrate different cultures and creativity, but it's also a great chance to invite people to come together and think of the challenges that we face in both a megacity and a small one: climate change, pollution, limited resources in the future, environmental disaster, etc. This is a great chance to learn from each other, exchange ideas and work together to build common and open tools for the future.